I like to think of a home as dynamic, evolving thing… a work in progress. Great enough to relax in and enjoy, but never really finished to where you would say, ”That’s it, I’m done!” Just as your wardrobe evolves over the years, you should look for ways to update and improve your home so it does not look tired or dated. I’m not saying to buy new furniture every three years. As a matter of fact, unless a piece sags, rips or has stains that can’t be cleaned, it can be fine for a decade. Ten years is the usual life of soft furniture, like a sofa. And even if it is in decent shape after a decade, it may start to look dated, so it might be time to make a change. However, smaller things, such as a new accent wall color, lamp shades, pillows, artwork, accessories, and even furniture layout, can be updated and changed any time. Just like an outfit can look completely different by changing the accessories & shoes, so can your living room. The transformation can be gradual, picking up something special here and there, and getting rid of things you no longer care for or don’t find useful. The room functionality of your home needs to transition as your life changes, also. Our house has changed a great deal over the years as we went from a couple, to parents with small children, and now to having “tweens”. Offices & guest rooms have changed into nurseries, toy/play areas, media rooms, etc. over the years, depending on what we needed at the time. But that’s a topic for another day! Ps. 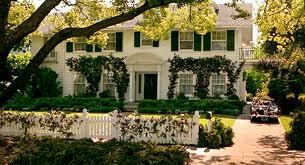 the above house is from the movie, Father of the Bride. Still one of my favorite houses ever!